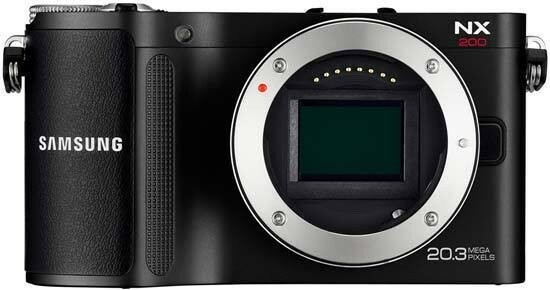 Where the NX100 was aimed squarely at the compact camera owner wanting to upgrade to something more capable, the more serious and sober NX200 is appealing to the more experienced photographer looking for a more compact alternative to a DSLR, whilst not forgetting its beginner roots. It largely succeeds in more than satisfying both parties, with the sharper design, revised control layout and the introduction of the Smart Panel and full range of creative shooting modes paired with the new filter effects, frames and hand-holding auto shooting modes. The new 20 megapixel sensor is the icing on the very generous cake, delivering excellent still image quality with a very usable ISO range of 100-3200 and full HD video complete with auto-focusing, full control over the exposure settings, stereo sound and a wealth of other options. The price of the NX200 is significantly higher than its predecessor, though, and there are a few unfortunate interface sacrifices, in particular the removal of the AEL button and the remote control socket, the complete lack of an integral flash or viewfinder and the very slow processing times when shooting in RAW mode, that detract a little from the camera's overall usability and its attractiveness when compared to certain key rivals. The jury's still out on the new i-Function button, though, even with its greater customisability and number of options, with opinions divided about whether it's a genuinely useful innovation or just another way to differentiate the NX system from its competitors. Being able to change the camera's key settings via the focus ring makes sense when holding it up to eye-level, but just seems plain awkward when it's held at arm's length, something that the lack of an in-built viewfinder makes inevitable. We think i-Function is still a better fit for the older NX10 with its built-in EVF, or the NX200 with the optional viewfinder unit. We also think that the supplied 18-55mm lens supplied with our review sample is the better kit lens than the 20-50mm optic, offering a wider focal range but more importantly image stabilisation. The NX200 offers all the advantages that a camera with a large APS-C DSLR sensor offers, namely better performance at higher ISOs and better depth-of-field effects than the smaller Micro Four Thirds format. I'd be happy to regularly shoot with any setting from 100-1600, and even 3200 is handy at a push. The fastest settings of 6400 and 12800 are less useful, although considering the amount of megapixels that have been squeezed onto the sensor, we're still very impressed with the NX200's overall performance. Despite the significant increase in the asking price, making the NX200 more of a serious investment than its predecessor, it still occupies an enviable position in the market, rivalling key competitors like the Sony NEX-7 at a much cheaper cost, whilst outperforming the Micro Four Thirds crowd in terms of image quality at a similar price-point. If you can live with the slow RAW processing times and lack of a flash or viewfinder, the Samsung NX200 is an enticing new entry into the constantly evolving compact system camera market.